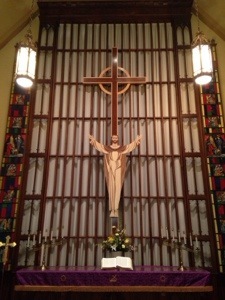 This cross is located in the sanctuary of Shelby First United Methodist Church in Shelby, Ohio. This my boyfriend Corby’s church and he took me there today before we headed off to Gathering Week at our seminary. The wood carving of Jesus was made by one of the congregation members. Today’s cross was submitted by Corby Blanton, who spotted it at a cemetery. 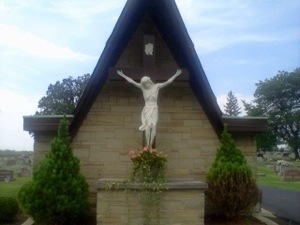 This beautiful cross is actually a crucifix, and it’s located at Sacred Heart of Mary Cemetery in Shelby, Ohio. 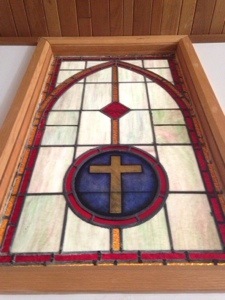 This cross is found in one of the beautiful stained glass windows at Unionville United Methodist Church. This particular panel is above the entryway to the sanctuary. This church is where my pastoral mentor, Rev. Doug Myers, serves. Being familiar with Pittsburgh, I was navigator to get to two different hospitals in Pittsburgh where parishioners were. 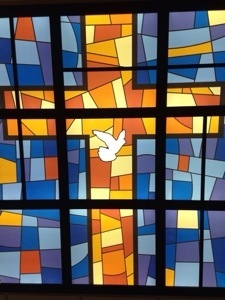 This cross is found on the ceiling in the main entryway at Mercy Hospital in the uptown neighborhood of Pittsburgh. I had to lay on my back on the floor to get a good picture. Mercy Hospital was founded by the Sisters of Mercy in 1847. It’s now part of the UPMC healthcare system. The Kingdom of God is already with us, but it is also still yet to come in its fullness. It is like a mustard seed right now, but the more fully we live into it, the larger it becomes until one day it will come in completion. Remember, 2 Peter tells us we “wait for new heavens and new earth where righteousness is at home.” (2 Pet 3:13) In Revelation, John writes of a time when the “kingdom of the world has become the kingdom of our Lord and of his Messiah, and he will reign forever and ever,” (Rev. 10:15). No one can say when this process of the coming Kingdom will be complete. That’s why Jesus stresses the importance of watchfulness in both Matthew and Mark. In Matthew 24:36, Jesus says “But about that day and hour no one knows, neither the angels of heaven, nor the Son, but only the Father…” and jumping down to verse 42, he continues “Keep awake therefore, for you do not know on what day your Lord is coming.” He describes it as a thief in the night and says that you must be ready. How do we get ready for the coming kingdom? Well, as we learned, the kingdom of God consists of righteousness, peace, and joy in the Spirit. We should strive to show the Kingdom of God to others sharing these with other people, and being a servant to them. Not necessarily to bring them to heaven, but in some sense, to bring heaven to them. Rev. Mike Slaughter of Ginghamsburg Church near Dayton, Ohio, says “As the church, we are not called to make “disciples” who simply make a one-time decision for Christ and then sit around waiting for the day they get to go to heaven. Our mission isn’t to get people into heaven but to get heaven into people – disciples who then in turn will go out and resource and reach the world God loves.” Before Jesus joined God back in heaven, he gave the Great Commission. In Matthew 28:18-20, Jesus said to his disciples: “All authority in heaven and on earth has been given to me. Go therefore and make disciples of all nations, baptizing them in the name of the Father and of the Son and of the Holy Spirit, and teaching them to obey everything that I have commanded you. And remember, I am with you always, to the end of the age.” Because of Jesus, we can do great things in both word and works, as Jesus did. Thus, we can tell people about the Good News, but we can also do good works like Jesus did—James reminds us that faith without works is dead. But we do have to get ourselves ready before we our able to help others. We can do this by repenting and believing in the Good News. I’m sure you already have done that, but it’s something we need to do on a continual basis. 1 John 1:9 reads “If we confess our sins, he who is faithful and just will forgive us our sins and cleanse us from all unrighteousness.” And it’s what God wants. 2 Peter tells us that the Lord does not want “any to perish, but all to come to repentance.” Here it also warns us that the day of the Lord “will come like a thief, and then the heavens will pass away with a loud noise, and the elements will be dissolved with fire, and the earth and everything that is done on it will be disclosed.” But God is patient with us, and desires our repentance. Paul, a servant of Jesus Christ, called to be an apostle, set apart for the gospel of God, which he promised beforehand through his prophets in the holy scriptures, the gospel concerning his Son, who was descended from David according to the flees and was declared to be Son of God with power according to the spirit of holiness by resurrection from the dead, Jesus Christ our Lord, through whom we have received grace and apostleship to bring about the obedience of faith among all the Gentiles for the sake of his name, including yourselves who are called to belong to Jesus Christ. Used under a GNU License courtesy of David Turner. Jesus himself may have inaugurated the Kingdom of God with his incarnation. Because Jesus spoke of the presence of the kingdom. In Mark 1:15 he says that “the time is fulfilled, and the kingdom of God has come near; repent, and believe in the good news.” In Matthew 12:28, Jesus said: “But if it is by the Spirit of God that I cast out demons, then the kingdom of God has come to you,” (Matt 12:28). Perhaps the most concrete example is when the Pharisees ask Jesus when the Kingdom of God is coming, and he says that it is “among you.” For Jesus, you see, the Kingdom of God is not a political or geographical entity as the Pharisees would have hoped for, but it is rather the power of God available to people because of Jesus. Jesus demonstrates the Kingdom of God with his acts of power and of love. Jesus himself said that he “came not to be served, but to serve” and this is one way of manifesting the Kingdom of God. He tells his disciples that if they wish to be great, they must first be a servant, or even a “slave to all.” (Mark 10:42-5) It starts like that: small, like the parable of the mustard seed, but branches out. It is also like the cedar tree in Ezekiel 17:22-24. It starts out as just a young twig planted on the mountain, but it produces boughs and bears fruit until it becomes a noble cedar and “Under it every kind of bird will live; in the shade of its branches will nest winged creatures of every kind.” (Ezek 17:23). There are examples in our world of things that are both already, and not yet. Mark Robers, in his blog on Patheos.com gives three examples. These include things like a couple on their wedding day just before they say their vows. They’ve already made a commitment, but it has yet to become official. In a sense, they are already married in all but name. Another example is a pregnancy and parenthood. Is a woman in her last weeks of pregnancy already a mother? She has prepared a room for the baby, chosen a name for the baby, and in a very real way, already loves the baby. But there may be something lacking in the qualifications for being a mother—the act of giving birth makes it complete. So this is another example of something that is already and not yet. A third example Roberts gives is of completion and graduation. After a Ph.D. student has an oral defense of his dissertation, the board may approve the dissertation, but the student is can not yet graduate until he sumbits the copies of his thesis, and pays his outstanding bills to the school. After that is done, the student may feel like he is done, but he won’t hold the degree in his hand until Graduation. So, could you call this student a doctor before the graduation. He’s met all the requirements, but it isn’t yet complete. In the New Testament, Paul tells us that the righteous will live by faith ( “”For in it the righteousness of God is revealed through faith for faith; as it is written, ‘The one who is righteous will live by faith.’” -Rom 1:17). And 2 Peter tells us that we “wait for new heavens and new earth where righteousness is at home,” (2 Pet 3:13) We pray for God’s Kingdom to come, as Jesus taught us. But again, what is God’s Kingdom? It contains righteousness, but also peace. Also in the Beatitudes, the peacemakers are blessed. The peace of God, we know, surpasses all understanding (Php 4:7). Peace, along with love and joy, is a fruit of the Spirit, according to Paul in Galatians 5:22. The Old Testament prophets also spoke about peace. Isaiah 57:19 reads, regarding mourners: “Peace, peace, to the far and near, says the Lord; and I will heal them.” Micah prophesies of the coming Savior, when he says he “shall be the one of peace,” (Micah 5:5). Thirdly, besides righteousness and peace, the Kingdom of God encompasses joy in the Holy Spirit. Joy is another fruit of the Spirit described by Paul in Galatians. In the OT, Nehemiah tells us that the “joy of the Lord” is our strength, (Ne 8:10). The joy of the godless, on the other hand, is “but for a moment,” (Job 20:5). In the NT, we know how the babe John in the womb “leapt for joy,” recognizing the presence of Jesus in Mary’s womb, (Lk 1:44). We, too, should have great joy because of Jesus.